There’s nothing like escaping into the wilderness for a few days to make you feel refreshed and energized. Come summertime one of my favourite ways to escape into nature is through backcountry camping. If you have yet to backcountry camp, I highly encourage you to give it a try. Unlike traditional campground camping, venturing into the backcountry means popping your belongings into a canoe or kayak and paddling out to a more remote location to set up camp. Whether you’re working up a thirst mid paddle or looking to refill your kettle on site, a water filter will allow you to get water directly from the lake or pond and turn it into clean, fresh water that is safe to drink. This way, you can save the space and weight required for pre-filled purified water and ensure you always have a source for hydration. Lifestraw is probably the cheapest water filter option for the backcountry. It is cheap, portable and very much functional. It makes drinking clean water quick and easy. You can just pop one of these in your jacket or pant pocket and use whenever you want. I know many people who just dip it directly in the lake water and drink. 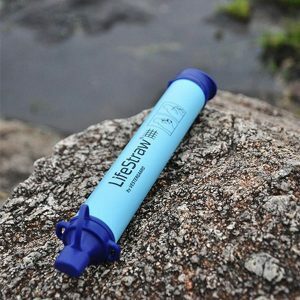 The original Lifestraw is specifically designed for the backcountry and claims to filter out 99.9999% of waterborne bacteria and 99.9% of waterborne protozoa. Today, they have a variety of different models intended for a more wide variety of needs and uses. If you’re planning to hike on your backcountry camping trip, a water bottle with a built-in filter comes in handy. 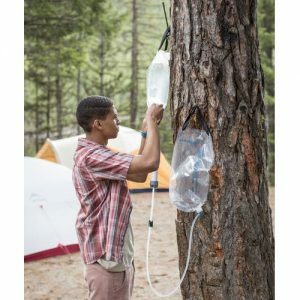 This way, you can refill while you hike, without feeling weighed down by your water supply. LifeStraw Go has the same functions as the LifeStraw — removing harmful bacteria and chemicals from water — but instead of dipping it in the water and sipping, you can fill the water in the bottle and sip as you go. Price Range: Around CAD $50. 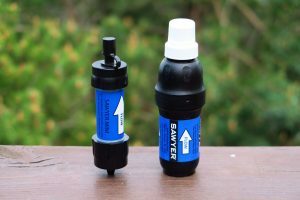 Sawyer squeeze filters can be screwed to a pouch filled with unfiltered water and the pouch can be squeezed to push filtered water on the other side. This is a very convenient and portable solution for backcountry campers. You can either squeeze the water directly into your mouth or to a water bottle. 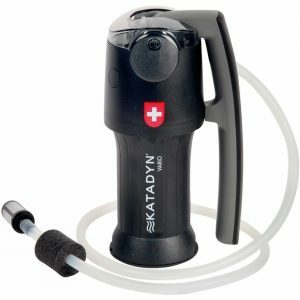 It is very quick and can easily fill a large water bottle. There is a mini version for people who prefer more portability and affordability, but the rate of filtration might not be as good as the regular version which means more time to fill your large nalgene bottle. Ideal for: For solo or for a group of 2. Katadyn Vario is similar to its predecessor model ‘Hiker Pro’, but only more advanced. This one has got multiple settings that you can alternate depending on how muddy your water is. The company claims this helps in achieving long life for the filter used. 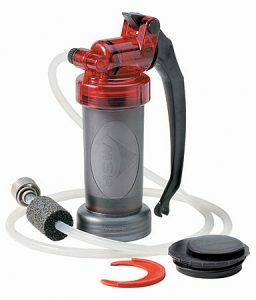 As for the pump style, it’s a convenient technique to throw one end of the tube into the water and pump fresh water into a bottle. It’s actually a very practical and convenient solution, especially if the water is at a little low level compared to where you are standing. Compared to the Sawyer, the Vario is a little bit on the expensive side, but it offers portability and reliability. Ideal for: Solo or for a group of 2. Output: 2 litre/min or 1 litre/min (two setting option). MSR MiniWorks is a similar product that is comparable to Katadyn Vario. MSR is also a trusted brand and the MiniWorks is priced similar to Vario. Ideal for: solo or a group of 2. A gravity filter lets the water flow through the filter bed by gravity instead of being pushed through by a pump or a high static head of pressure. This makes it a convenient setup to filter relatively large quantity of water that can be used for cooking and drinking purposes. 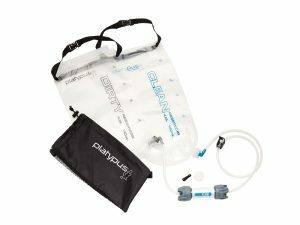 The Platypus GravityWorks is probably the most popular gravity filter among backcountry campers. It can transform four litres of contaminated H2O into drinkable water within a mere 2.5 minutes. This filter includes two four-litre reservoirs: one for dirty water and one for clean. 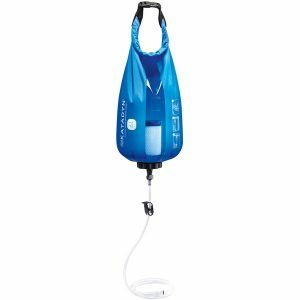 With a lightweight design and convenient hanging loops, this system is ideal for setting up at a campsite after a full day of paddling. Ideal for: medium to large groups, for backcountry cooking, and generally for filtering large quantity of water. It’s lightweight, it’s a beast, and it’ll turn mud into clean water. Katadyn Gravity Camp works similar to Platypus and comes for a lesser price. You can also get a 6L bag as opposed to the 4L offered by Platypus. Katadyn has been gaining popularity in the recent years, however many still consider Platypus the classic option, and love the quality and reliability of the product. Contributors: Mackenzie Shand & Sakthi. After using a pump water filter I switched to the platypus gravity filter and have never looked back. Like you say, it’s great for large groups, but even when I go solo there is no real disadvantage to it either. I’ve found it’s light, easy to use and reliable.